Khyungpo Naljor was born in a year of the tiger in the southern part of Tibet, into a distinguished family being the same extended family clan from which the lord of yogins Jetsün Milarepa hailed somewhat later: the clan of the Khyung, or Garuda, the legendary great bird that is guardian of the north. His father’s name was Khyungpo Chujar, and his mother’s, Tashi. Thus, his own name meant “the Yogin of the Garuda clan.” A portent marked his birth: The great Mahasiddha Amogha came flying through the air from India and made the prophecy that this newborn child, who was already highly realized, would in time come to India and there receive the profound transmissions that would make him a greater guide of beings. The qualities of Khyungpo Naljor began to manifest while he was still very young. When he was five years old, he told detailed stories about his past existences, and revealed insight into his lives to come, and into the future in general. By the age of ten he excelled in reading, writing, arithmetic and both Chinese and Indian astrology. At twelve, in accordance with the tradition on his father’s side of the family, he studied the Bon teachings. 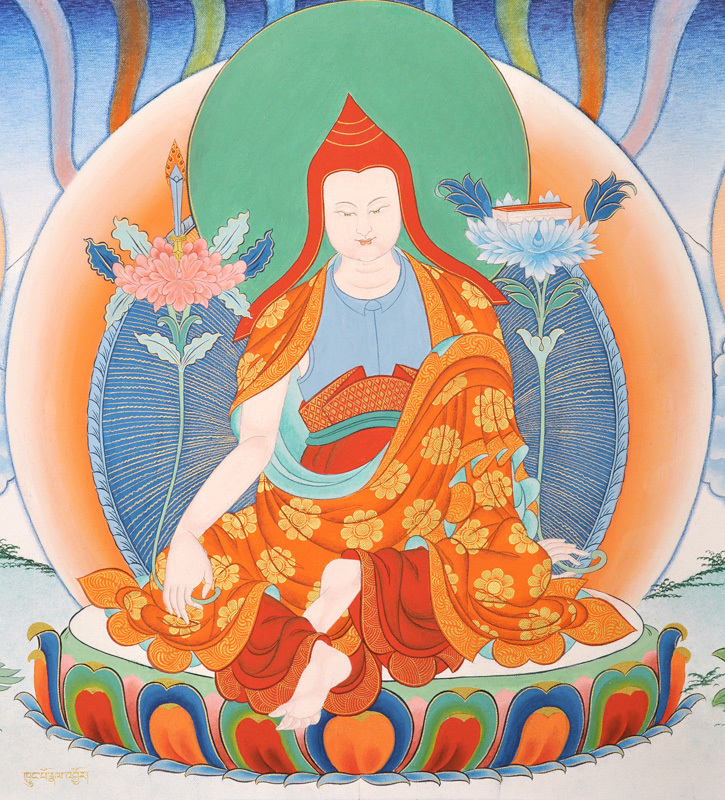 Later on he practiced Dzogchen, and finally, Mahamudra. Then, taking jewels and gold dust to present as offering, he left for India and Nepal in search of teachings during his journeys Khyungpo Naljor was unconcerned about comforts for himself and endured much hardship. Over the course of seven journeys, he studied with a hundred and fifty sages and fifty great adepts such as Maitripa, Vajrasanapa, and Rahula. He adopted five of his teachers as his glorious Root Lamas, of these: the wisdom Dakinis Niguma and Sukhasiddhi had received direct transmissions from Vajradhara the enlightened enjoyment body of the sixth Buddha. They took delight in Khyungpo Naljor and granted him the ultimate oral instructions that cut off all distractions and practiced single-pointed. All doubts were allayed and he obtained both extraordinary and common accomplishments. Khyungpo Naljor established his monastic seat at Shang-Shong in the Yeru Shang valley, which is how he came to be called Lama Shang and his lineage, the Shangpa, got its name. He had thousands of disciples from all over Tibet and all walks of life. On numerous occasions he performed miracles which were witnessed by all present. Khyungpo Naljor passed away at the extraordinary age of approximately 150 years. His meeting with Niguma came about in this fashion. After he had received teachings from many great Siddhas, Khyungpo Naljor again searched for highly realized teachers from whom he could receive more advanced instruction. The most realized teachers he encountered told him that one with his qualities should seek the great Bodhisattva who was not separate from Vajradhara in her realization and in the profound teachings she could skillfully transmit. Khyungpo Naljor asked where he could meet such an enlightened being and was told that her presence could manifest anywhere to highly purified beings. Unfortunate beings, those still caught in emotional afflictions, would find it very difficult to encounter her at all, since she had dissolved her physical form, attained the rainbow body, and achieved the level of Vajradhara. Every now and again, however, she would visit the most sacred cremation grounds and, leading a host of dakinis, would preside over great ritual offering feasts (ganacakra). There someone might have an opportunity of seeing the great Niguma. As soon as Khyungpo Naljor heard the name of the great dakini, he felt such devotion, like an electric shock, that tears swelled up in his eyes. Immediately he set out to find her at the great charnel ground called Sosaling. As he traveled, he continuously made supplications to the Three Jewels. When he reached the cemetery, he saw above him in space at the height of seven banana trees, a female deity bluish in appearance, who wore elaborate bone ornaments and held a trident and a skull. As he gazed at her, he sometimes saw one deity, and sometimes many; some were in meditation posture, and some were dancing or making graceful gestures. He felt sure that this was the great Bodhisattva Niguma, and began to make reverent prostrations to her, sincerely imploring her for transmission of the teachings. But her words did not dismay Khyungpo Naljor or make him retreat. Again he proclaimed his longing to receive the transmission from her. After his second plea, Niguma made this stipulation: he must offer gold if he really wished to receive teachings from her. Khyungpo Naljor had five hundred gold srang with him, and these he took out and tossed up to her as an offering. As the gold came into her hands, she scattered it into the air, so that it fell all over the forest. This behavior just increased Khyungpo Naljor’s confidence that she was indeed the great Niguma. A flesh-eating dakini would certainly have felt attachment to the gold and kept some. With deepening conviction he continued to beseech her for the teachings; Niguma turned her head from side to side, and looked into the different directions with her blazing eyes. So summoned, a great throng of dakinis surrounded her, all busily at work. Some were building palaces, some constructing mandalas, and others were making preparations for Dharma teaching, and for the ganacakra that would follow. Suddenly Khyungpo Naljor found himself in midair at the height of three banana trees. Looking up towards Niguma, he saw that the great being was on top of a golden mountain, surrounded by a vast retinue of dakinis. Down the four sides of the mountain, rivers fell. Khyungpo Naljor wondered out loud if this amazing mountain was truly there or whether he was witnessing a miraculous performance by the dakini. On the following day, Niguma once again gave him three times the complete transmissions, with the detailed explanations of these doctrines; this time the transmission took place in the waking state. One commitment she asked him to keep was this: only he and another Mahasiddha, by the name of Lavapa, had the transmission into the six doctrines of Niguma; the teachings should be kept secret until seven generations had passed in an unbroken line of transmission from one Lama to one chosen disciple in each generation. After the seventh generation, it would be appropriate to give these teachings more widely for the benefit of all beings. Khyungpo Naljor is the third of the Initial Seven Jewels of the Shangpa Kagyü.